One look at this building within the heart of Seville, is enough to know that history lurks behind each crumbling corner. Located a few steps away from the Cathedral - the third largest church in the world - the landmark Peyré building, a former textile warehouse, was originally built in 1790 and refurbished in 1919 by regional architect Aníbal González. 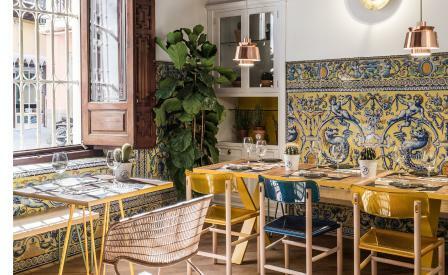 Bizarrely, food by chef Javier Carmona is and eclectic update on typical tapas fare with a mix of Mediterranean notes and some Asian options thrown in for good measure. Expect tasty ham and mustard croquettes, yaki udon Iberian pork noodles and french toast brioche with dulce de leche to finish.